ZERO-Max has released its next generation of ServoClass couplings featuring zero backlash and higher torsional stiffness for servo motor applications with high reverse loads and precision positioning requirements. Manufactured from ROHS compliant materials containing no banned substances, these new couplings are designed with 304 stainless steel disc packs and 7075-T6 aluminum hubs and centre members. The unique design provides high torsional stiffness with low inertia to avoid system resonance in all types of servo systems. ServoClass couplings handle system speeds up to 10,000rpm and have a torque rating range from 0.5Nm to 60Nm. A system designer can select from 16 sizes and from combinations of inch and metric hub bore sizes to meet exacting servo drive requirements. All models and sizes feature clamp style mounting hubs with recessed, corrosion resistant clamping bolts. As the application cycle times become faster, the wind up in beam couplings or the fragile nature of the bellows couplings become more of a serious problem. The robust design of the Zero-Max coupling performs reliably in precision, high speed servo applications. 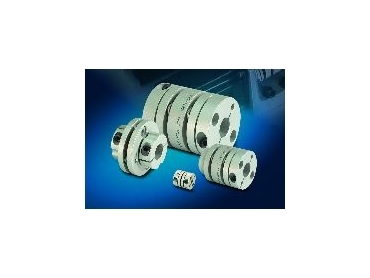 The couplings are suitable for use in most high precision applications including packaging machines, pick and place systems, printing machinery, machine tools and most systems utilising servomotors. A free brochure is available that includes complete selection information for ordering and a CD ROM with the Zero-Max ServoClass sizing and selection software included. The CD ROM gives the designer the ServoClass catalogue in PDF format, a comprehensive sizing and selection program and 3D CAD drawings for all of the couplings.